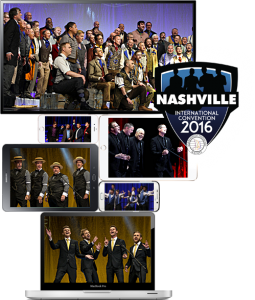 Home / Uncategorized / Barbershop Harmony Society offers FREE webcast of world championships to students and educators Become A Member! See the greatest spectacle in close-harmony singing — on your phone! FREE! You may have heard barbershop harmony before, but you’ve never experienced anything like the WORLD CHAMPIONSHIP EVENT coming July 5-9. More than 2000 men in quartets and choruses ranging from four to more than 150 men will compete for the gold medals. Broadway, show tunes, old chestnuts and contemporary pop music will light up screen, in a harmonic spectacle unlike anything you’ve ever seen. We want you to see what this is all about. So we’re giving it away for music educators and students. Log in to https://bhswebcast.com/edu/ using your valid school email address, and receive FREE access to all contest sessions in a lower-bandwidth feed optimized for mobile devices. If you love what you see, you can also upgrade to our full hi-def packages at a reasonable price. The Barbershop Harmony Society wants everyone with a passion for music to see what this lifelong expression of vocal artistry looks and sounds like. Share this with your students, classmates, and fellow-travellers in the music world.